My mother and I arrived the wells of Qabri daharre around 5 PM of a sunny day. How many days we travelled from Nogob to get there, I do not remember. At nearby, a group of Somali women had a get together. Perhaps it was the traditional Xaawo and Faadumo gathering, where women munch on popcorn, sip tea, and just have fun. Two uniformed Ethiopian police officers walked by. And the women offered the officers some tea. Whether the offer was out of fear, or out of courtesy, it was hard to say. At any rate, a woman, that I later learned to have lived in Harar and spoke the Amharic language took charge of dealing with the two police officers. She poured the tea in a cup and filled it, before she handed it to one of the officers, she took a teaspoon, and scooped a little bit of tea from the cup she just filled, and tasted it. Then she handed the cup to one of the officers. Then she repeated the same process. She poured the tea in cup and filled it. And then took the teaspoon, scooped a little bit of tea from the cup, and tasted it. And then handed the cup to the second officer. Someone later explained that the woman was tasting the tea to reassure the officers that they were not being poisoned! That pretty much underlined the lack of trust between the Somali people of Qabri daharre, and the occupying Ethiopians. I was four-years-old then. After about a year or so, I was enrolled in my first Dugsi Quran and joined my childhood friends including Maxamud Qawdhan, Xaaji Barre’s boys: Maxamud, Sandoon, Lugey, and Bilaal Xaaji Xuseen, Xasan-Khaliif, Axmed-Qabri-daharre, Faruurow, Cabdi Aadan Xaashi(aka Washalaa) and others and others. The one characteristic we children all shared was the love for Somalia. Somaliness was in our blood! We believed that Somalia was this majestic land in which the best people on planet lived. We children wholeheartedly believed that the Somali is the best, the bravest, the smartest and the strongest in the whole universe. Of course, the only other people in the universe that we knew then to compare with the Somalis were the Ethiopians, all of whom we called Amxaaro, the dominant group of the time. It is difficult to put into words the depth of our love for Somalia, and the pride we felt in everything Somali. Even the things that had nothing to do with the Somalis, the mere use of those things by the Somalis made those things appear superior in our minds. For instance, even though we were small, we knew the Somali Airforce used Russian made Mig fighters, whereas Ethiopians used American made Phantom that we used to call them Jets. Technologically, the American might have been superior. But to us, even if we knew that fact, which we did not know, it would not have mattered. In our mind, the Mig was superior because it was the one used by the Somali Airforce. Similarly, in Northern Somalia, the commercial trucks in the region were entirely Japanese made Nissans and Isuzus, whereas in Ethiopia, the commercial trucks were primarily Italian made Fiats. Again in our minds, the Japanese were superior because of their association with the Somalis. There were couple of Nissan commercial trucks captured by Ethiopia that for years rusted at Qabri daharre’s police station. And to us, the kids, those trucks looked out of this world because we knew they were Somali trucks. Even when we wanted to commit a mischief, we would be selective. If there was an Ethiopian to target, we would spare the Somali! There is an incident relevant to this point that is still vivid in my memory. The area between the soccer field and the little bridge that was close to the Qabri daharre’s police station used to be vacant and derelict. Then one year, the area was divided between a Somali family and an Ethiopian one, and the area was slated for cultivation. I didn’t know the Ethiopian family, but the Somali one was Cabdi Adar’s family, a prominent family in Qabri daharre. The division of the land between the two families, however, was unfair. The Ethiopian got the most fertile section that any time it rained, both the water and good soil would gravitate to the Ethiopian’s section. Cabdi Adar’s section was arid and parched. Thus, when the two sections were cultivated, the Ethiopian, predictably, produced bumper crop, whereas Cabdi Adar’s failed. One day, just before the time the crops were to be harvested, four of us youngsters walked by the farm. Then, one of the boys had an idea: “Guys” he said “Why don’t we get Quwaax from the Ethiopian farm, and eat it at Cabdi Adar’s section. People would just think we got it from Cabdi Adar’s. And even if we are asked, we would just say, we got it from Cabdi Adar’s?” It sounded a brilliant idea, and we acted upon it immediately. Now, if the crop of the two farms were of equal quality, naturally, we would have raided the Ethiopian. But the fact that the Ethiopian was better with better Quwaax made our decision to target it even more compelling. To avoid any suspicion, we entered the farm from the Cabdi Adar’s side, then we crossed to the Ethiopian. The fence between the two sections was easily passable. We quickly checked the stalk and the leaves for the juicy ones that we called ‘Kiinje’. Each boy got one Kiinje, and we quickly came back to Cabdi Adar’s section. As we started to enjoy our loot, we saw a man coming from a distance, from the north, from the direction of the 9th Brigade garrison. The man was wearing a civilian clothes, but we knew he was a soldier, because only soldiers lived at the 9th Brigade garrison. We were concerned, so we watched the man carefully. After observing him for about couple of minutes, we concluded that he wasn’t posing any threat to us, based on two factors: First, all the time he was walking, the man was looking on the ground. Second, all the time he was walking, by the movements of his hands, the man seemed to be singing to himself. Put these two factors together, and we concluded that the man could neither see us, nor pose any threat on us. So, we forgot about him altogether. What we didn’t realize was that the man outsmarted us! And the acts of him looking on the ground and singing to himself were merely a ploy. We found out that after it was too late, because he captured all four of us! First, he captured two, and then he threatened the other two, and before long he had all four of us under his control. Holding two boys on each hand, he dragged us to the police station. When we were walking over the little bridge that was just before the police station, I felt my back pocket and realized I had small sabuul or ear of maze in it. Realizing that this could complicate things for me, I discretely dropped it on the bridge without the soldier noticing what I did. We reached the police station, and we were told to sit on the floor of one room, all of us together. The officers on the shift called the Ethiopian farmer whose farm we raided. The farmer was asked to bring the evidence of the crop that we destroyed so that the damage could be assessed. They also called our parents. The Ethiopian farmer arrived first. That farmer was very dishonest! Expecting perhaps to get a hefty compensation, the man destroyed his own crop and brought a huge stack of the biggest and the best ears of maze of his farm! When he came in, he gave us a killer look perhaps muttering profanities under his breath. We were shocked about the man’s dishonesty. And we also understood the implication that we would be held responsible for all the crop he himself destroyed, but there was nothing we could do about it. We just sat there helplessly waiting our fate to be decided. After about an hour or so, Xaaji Xuseen (aka Xaaji Gees-diir) whose son Bilaal was among us came to the police station. If anyone in Qabri daharre was coming to our rescue that day, Xaaji Xuseen was the right man. The Xaaji was experienced and knowledgeable about world affairs. But perhaps even more important, he was no nonsense guy by nature! When he came to the police station, Xaaji Xuseen did not come to the room we were held. And he didn’t even bother to see us. Instead, he demanded to see the chief of the police, and when he saw him, he admonished him so harshly, saying to him things along the line, “No one ever heard of a government that arrests 7-year-olds! You guys are behind times!” The chief of the police was so embarrassed that he quickly dispatched another officer to the room we were held. The officer came running, “Get up, get up, get up……go home, all of you!” He said. The police of Qabri daharre, whose officers essentially made the law based on their whims, issued a new proclamation that day. “From today on” they said, “any boy who commits a mischief will NOT be arrested. Instead, his parents will be taken in!” If we interpret that in the language of today, that was a proclamation for the protection of the children’s rights. As for the greedy Ethiopian farmer who pillaged his own crops in the expectation of huge compensation, he did not get one single cent! The chief of the police was still smarting from the humiliation he suffered at the hands of Xaaji Xuseen, and he was in no mood to revisit that embarrassing file under any circumstances. Therefore, the greedy farmer ended up licking his wounds, and went home empty handed. That was Xaaji Xuseen at his best! Our view of Somalia and the ability of the Somalis were so wildly exaggerated that it was bound to crash to the ground. And one day it did. A Somali soccer team visited Ethiopia, and had a friendly match against an Ethiopian team in Dirri-dhaba, a Somali majority town. The Somali team was beaten so badly. I am not certain whether the score was 7-2 or 7-4, but it was a humiliating defeat! However, we accused the Ethiopians of cheating! How? We claimed that the Ethiopians filled the field with water, so every time Somali players tried to run the ball with, they ended up slipping and falling, as if the Ethiopian players had some magic shoes that prevented slippery and falling. But that was who were: Somali kids, who could never accept that the Ethiopians could defeat the Somalis on anything. The market of Qabri daharre was in those days located on the east or the southeast of the town. The Ethiopians, all of them, soldiers, teachers, workers and the few businesses that were there, all of them lived on the west of the town. 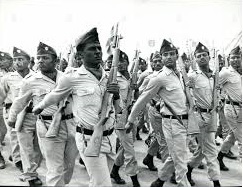 It was mid 1960s after the war between Somalia and Ethiopia. The spirit of Somaliness and the antagonism to the Ethiopians were at their heights. So, when an Ethiopian, any Ethiopian, wanted to go to the Somali market, which was in those days the only market, they would have to go through the entire Somali section in order to get to the market, and when they comeback go through the entire Somali section again. This wasn’t only inconvenient for the Ethiopians, but also dangerous. And the danger was that, unless they were in a group, any Ethiopian who ventured alone into the Somali section in those days would risk to be insulted, harassed, beaten, and occasionally killed. It was really so dangerous for the Ethiopians to live in Qabri daharre in those days. The Ethiopian government and its soldiers had enough: They moved the market at gun point and relocated at the boundary between the Somali section and the Ethiopian section. But still, the danger to the Ethiopians persisted. I remember a particular incident. Several incidents that were staged against the Ethiopians had taken place. Then one day, an Ethiopian, who might have been a soldier, went to visit a Somali friend of his. The Somali man was called Cabdi Cadami, who was well integrated with the Ethiopians. He spoke Amharic. He had a job with the government. And he had many Ethiopian friends. 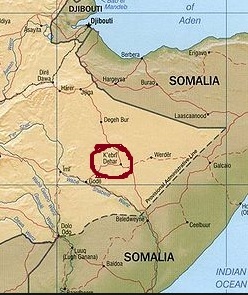 Cabdi Cadami’s home was located in the Somali section. I think it was an evening when the Ethiopian went to Cabdi Cadami’s house. And to make matters worse for the Ethiopian, Cabdi Cadami wasn’t home at that time. I don’t exactly remember whether the man was chased from nearby to Cabdi Cadami’s home, or whether he was targeted while he was knocking on the door, but in either case, the man was killed right at Cabdi Cadami’s doorsteps. It was said the last words of the Ethiopian man were, “Abdi Adami…Abdi Adami…Abdi Adami…..” While knocking on the door. The killing of that man was, for the Ethiopians, the straw that broke camel’s back. The morning after, or the morning after that, the entire people of Qabri-daharre were rounded up. Fully armed soldiers descended on the town early in the morning, and went house to house, and rounded up everybody. When the soldiers came to our home, guns drawn, and called everyone to get out, my mother made me hide under the bed, but she went with soldiers along with the neighbours who were rounded up. All the people were taken to an open space, on the east of the town, on the bank of Faafan ravine. The situation was grim, and the rumor just before the roundup was that everything would be dependent on the order that was expected to come from Addis Ababa. If the order was given people to be slaughtered, the entire people would be massacred. Since we were always thinking about Somalia and of the Somali people, it seemed to me that our brethren were praying for us!